The man who assassinated Hirobumi ITO awaits his execution in the snow-swept Lushun Prison. Is the drama of the Japanese man depicted there a symptom of the antiforeignism and unequal society which plagues the world today and by far leads to the cycle of animosity? The play which won the 5th Yomiuri Drama Award for Best Director (Mr. Nobuhiro NISHIKAWA), and also won the 32nd Kinokuniya Drama Award for Personal Achievement (Mr. Tatsuo KANESHITA) is now given a new life. In 1910, a Korean male named An Jung-geun is incarcerated in prison in Lushun, (former Manchuria) for the charge of assassinating the then Supervisor to the Resident General of Korea, Hirobumi ITO at Halpin station square. Amid the feud among an elite high-official from the Foreign Ministry dispatched to "securely" carry out An's execution for the sake of saving Japan's honor as the victor country of the Japanese-Russo War, Chief Prison Officer, Chief Warden, a model prisoner who is a good source of inside information, and the Prison doctor pretending to be a cynical onlooker, the silent dialog between the Korean interpreter who was sent off from the Resident General of Korea and a death-row inmate, An Jung-geun emotionally stirs those human-beings who are in conflict with one another. While outside the window the snow keeps falling. Kaneshita was born in Hokkaido and established the theatrical production group The Gazira in 1987. He has written many journalistic-style works based on real-life crimes, accidents, and historical facts, with acute observations of the hidden aspects of society and human nature. Kaneshita won the 42nd Art Encouragement Prize for New Artists awarded by the Ministry of Education, Culture, Sports, Science and Technology for Tatsuya-saiainaru mono no soba e (Tatsuya-To the Side of My Beloved), about the nineteen-year-old serial killer Nagayama Norio. His wartime play PW-Prison of War and Kanka (Ice Blossoms) which he wrote for the Bungakuza, earned him the 32nd Kinokuniya Drama Award for Personal Achievement and the 5th Yomiuri Drama Award for Best Director. Recent plays include "Gorgon","Frankenstein" and "Dogra Magra". Kaneshita is an associate professor at J. F. Oberlin University. Nishikawa was born in Tokyo. His first directed play is "Crystal Clear" in Bungakuza Atelier in1984. He has stayed in the UK for a year of Program of overseas Study for upcoming artists since 1986, and he served as assistant director of Roger Rees and Kevin Peter Hall in National Theatre. After returning to Japan, he has directed many productions, including "My Children! My Africa" (1992) ,"Twelve angry men"(1995) and "My fair lady"(2004). 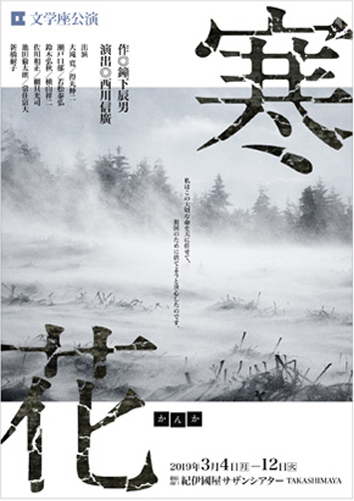 "Kanka (Ice Blossoms)" which he directed at the Bungakuza Atelier in 1997 have won the 5th Yomiuri Drama Award for Best Director. Recent plays include "death of a salesman" ,"Natsu no owarino semi no youni(Like cicadas at the end of summer)" and "Shinjitsu(truth)" in Bungakuza. 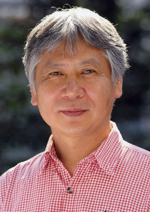 And he is a visiting professor at Tokyo University of the Arts, and he serves as the president at the Association of Japanese Theatre company and the Japan Directors Association, and he serves as deputy director at the theatrical training institute in the New National Theater Tokyo. ※1 For purchase of Tokyo resident discount tickets, please make payments only by postal transfer. Upon confirming the address is within the Metropolitan Tokyo, tickets will be sent immediately to the confirmed address. ※2 Youth discount tickets require age-verification ID, and junior and senior-high school students need to show their student ID at the entrance. ※Please be sure to reserve your tickets first through the BUNGAKUZA Box Office Direct phone number before transferring payments. This information will also be given to you when you make the ticket reservation.